Wearing History #E-1008 Introducing Evelyn! Our first pattern with photo instructions! This is a PDF DOWNLOAD to print at home. This pattern prints on A4 or USA Letter size paper. If you want a mailed wide format pattern, you can purchase that version in my shop. This pattern is multi-size with waist sizes 22-42" all in the same packet. This is based on a MISSES SIZE pattern. Plus sizes, petites, etc, may need adjustments. PLEASE SEE PHOTOS FOR SIZE CHART. Evelyn is a beautiful 1910s era skirt that can be made with or without pockets. This skirt hits two inches above the natural waist and falls from the top of an internal fitted waistband. The skirt fastens at the side with hooks and eyes and snaps. The pocket version of the skirt has fold down tabs that attach to a belt. The back of the skirt is gathered. When made without pockets, this works exceptionally well with suit jackets. When paired with a blouse in matching fabric, it makes a wonderful skirt for a two-piece dress. This pattern is a Wearing History Signature Styles pattern. It was based on an original 1917 sewing pattern, and includes not only the original period sewing instructions, but also modern step-by-step photo instructions and cutting charts for modern fabric widths. 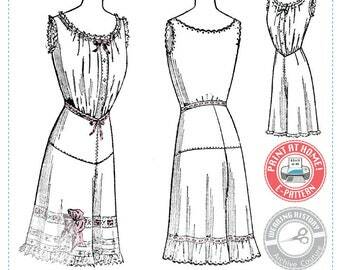 This pattern also includes notes about this pattern from Delineator magazines of 1917. Informative videos about this pattern are coming soon! Evelyn is shown with the Elsie blouse pattern in our adventure look, and with the 1910s Blouse and Guimpe pattern for the traditional 1910s look. Blouse patterns sold separately. Pair this with our 1916 Suit Pattern for even more 1910s looks! This pattern is a great option for steampunk, historical, or modern wear! This pattern is estimated to be an Intermediate pattern difficulty, but adventurous beginner sewers may be able to construct this with a little patience. 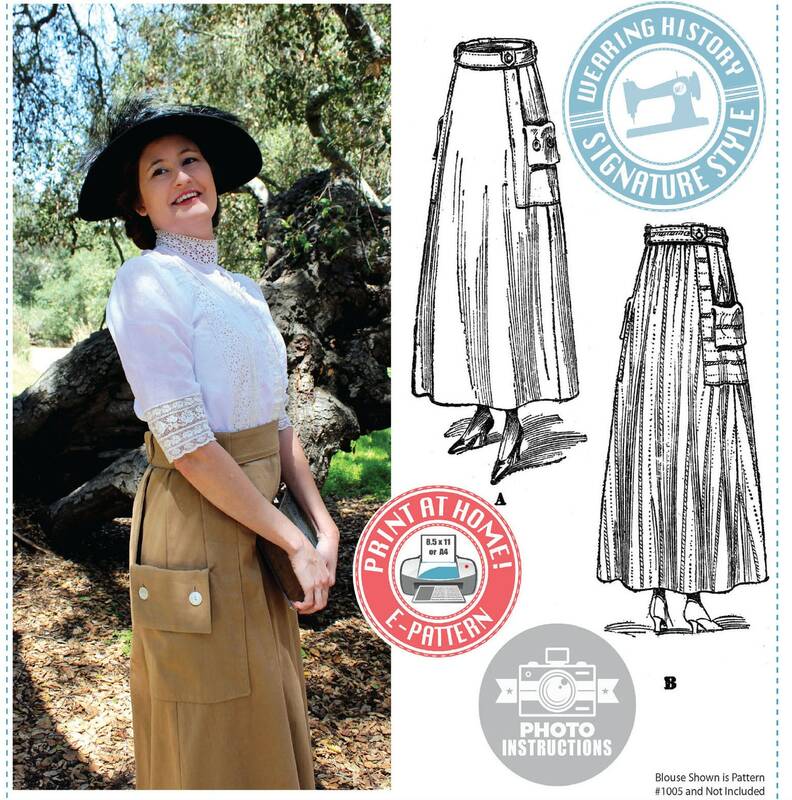 Our photo instructions make this skirt pattern quite user-friendly! Because this was based on a period original from an era in which women wore corsets, a mock up is HIGHLY SUGGESTED. Test construction and fit on your unique figure before cutting into your fashion fabric. YOU WILL NEED ADOBE READER, A FREE PDF READER PROGRAM, IN ORDER TO OPEN AND PRINT THIS PATTERN. This pattern is formatted for USA Letter Size and A4 sized paper. You will need to print this pattern to 100% scale. Open the "READ-ME-FIRST" File for instructions on printing and piecing your pattern. This pattern is tiled into letter sized paper. This pattern file is formatted to fit on both sizes of paper, and there will be varying thicknesses of white border, which will be cut off, according to pattern instructions. You will print these documents on your home printer, cut, and tape them together, to form a larger pattern layout. Then you cut and use your pattern just as you would a normal home sewing pattern. This pattern comes in a ZIP folder that must be decompressed to use, and uses a LOT of paper. 1 for the e-pattern "how to" sheet. 45 pages for the skirt, pocket flaps, waistbands, and belt pieces in one file. 8 pages for the pocket piece. FOUR different size pocket files are included, in order to conserve paper. You select the pocket to print based on your waist size. 74 total sheets of 8.5" x 11" sized paper or A4 sized paper are needed to print this pattern. You can read the sewing instructions on your computer to reduce paper use. This pattern is also available as a mailed, wide format paper pattern. You can find it in my shop. This pattern is awesome! A few hiccups along the way, as is common when working with vintage patterns. An experienced seamstress is sure to come out with a beautiful skirt. Perfect for the play I’m costuming for! I accept Paypal payments and payments via Credit Card. I charge 8% Sales tax for California residents, per California regulations. Your transaction will show up as "Wearing History" in your paypal account, which is my legal business name. As of 2015, EU residents will need to pay VAT on digital purchases. Etsy handles all collection and remittance of tax. You will see the charges at checkout for your digital purchases if you are an EU resident. I will do layaway for vintage items over $150 each. The cost can be split up into 3 bi-weekly payments of the item price, with the first payment to have the shipping cost added. Layaway payments are non-refundable, so please be certain of your purchase decision before requesting layaway. Returns and Exchanges are not allowed on sewing patterns. Sorry! VINTAGE ITEMS- If you have received an item in error, or an item you haver received is defective, contact us immediately, by filling out the refund request form, so we can rectify the situation. If you believe that you receive an item that was misrepresented, or you find there is a problem with your item upon receipt, please contact me ASAP so we can work on a resolution. Most vintage items listed are one of a kind, so items will not be able to be substituted or exchanged. I do value each of my customers and want you to be happy with your purchase! Regarding original vintage patterns: If I made a mistake on counting vintage pattern pieces, or if you purchase a pattern that is in factory folds and when you open it you find it is missing pieces contact me and return within 3 business days of receiving it and the original cost will be refunded after the pattern is sent back. This, of course, does not apply to patterns that are noted in the description as missing pieces. Tell me how Wearing History patterns differ from vintage patterns. --You do not have to be afraid of harming a delicate original vintage pattern. --They cost a fraction of the price of purchasing an original rare vintage pattern. --The patterns are easier to understand and clearly marked pieces instead of holes or dot markings. --Most patterns are multi-sized so you can cut the size you need. Original vintage patterns were only single size in a packet. --E-patterns are downloadable and printable at home. You can buy and start sewing in a weekend! --Several Wearing History patterns are drafted by me and/or have new instructions (These are the Signature Styles patterns). What sort of fit or ease can I expect with these patterns? --Very little ease is included in comparison to modern standards, and most run true to size. --Armholes and sleeves fit higher than tighter than modern standards. You may need to alter your sleeves & armscyes if you prefer modern fit with more ease. --Resto-Vival patterns are based on original period patterns and were meant to be worn with period foundations- Girdles, period bras, etc may make a difference in fit. A Victorian or Edwardian garment will be sized to fit over a corset. --ALWAYS make a mock up before cutting into your final fabric. What type of patterns are your "Signature Style" patterns? New patterns based on original period sources or brand new designs with new step-by-step illustrated instructions, improved fit, and new cutting layouts and yardage requirements for modern fabric widths. These patterns can either be based on period originals with changes that improve the original pattern fit and instructions, or a unique draft to Wearing History that has been drafted by me personally and heavily researched to be period correct. These patterns also include instructions that are hand drawn or digitally drawn and composed by me personally. What type of patterns are your "Resto-Vival" patterns? Resto-Vival patterns are restored and revived based on historical pattern source material. Original patterns are usually available only in single sizes, precut from tissue paper and totally unprinted, with details like grainlines and darts indicated only by small perforations. Resto-Vival™ patterns are clearly marked with drawn and labeled markings. Resto-Vival™ patterns follow the period shapes of the original patterns, maintaining the historical accuracy of the completed garment. Original period instructions are included, the complexity of which can vary from pattern to pattern. Older patterns may have text only instructions. Intermediate to advanced sewing knowledge is recommended. We suggest keeping a sewing book handy. Why do you say to make a mock up? Can't I just cut it out and start sewing? I ALWAYS suggest to make a muslin mock up to check fit and construction before cutting into your fashion fabric. Every body is different, even if measurements are similar, and making a mock up of inexpensive fabric is the only surefire way to make sure your garment will fit your unique figure and have the ease you want. Don’t make a garment out of your final fabric without testing and expect it to be perfect- it’s just not feasible. It’s kind of like going shopping at the mall– you don’t expect every item on a hanger to fit you perfectly and it requires some trying on. Not all sizes run the same between all the stores and brands. The same is true of sewing patterns, so make your mock up! Do you offer pattern making or pattern grading services? Do you do custom sewing? I'm sorry, I do not offer pattern making services, pattern grading services, or custom sewing. Please view each individual pattern for size information, as size can vary from pattern to pattern. Please keep in mind that patterns are based on misses or women's sizing. Plus size, juniors, petites, and tall sizes will most likely require additional alterations so I highly suggest making a mock up before sewing your final garment. Will I receive a diagram I need to draft, or a full size pattern? All patterns are full size, unless otherwise indicated. They may use a LOT of paper to print, but are already sized and graded for you. Tell me more about e-patterns. What kind of format are they, and how do I assemble? When you buy an e-pattern from me, you receive a multi-page PDF file you download to your computer and print at home. The patterns are formatted to fit on both 8.5 x 11 sized letter and A4 paper. All pages are tiled to make it easy for home sewists to print at home and then assemble into a larger pattern sheet. You print the patterns at 100% scale or "actual size", and then cut and tape the dotted lines together. All pattern pages are numbered, so you can keep track of you process. An additional file is included to help with assembly- make sure you read it before you print your files. I have been told by many customers that my e-patterns are some of the easiest to assemble, and I'm thankful for their high praise! Do you sell wide format, printed patterns that can be sent in the mail? Yes, I do. These are not currently listed in my Etsy store.